Bank House Bed and Breakfast01768 868714work01768 864051fax Guest AccommodationA beautiful period house with a large terraced garden giving fabulous views to the Lakeland fells. Stunning dining room with amazing views, and a beautiful sitting room for guests and outside bike storage and plenty of parking. Bank House Bed and Breakfast sometimes limits bookings to 2 or more days. Large room with a ensuite. the shower is double sized but the ensuite on is slightly smaller than the rest of our large ensuites. 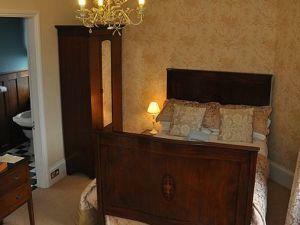 Double bed with top quality mattress. It is a beautiful room with wonderful morning light. room 3 sometimes limits bookings to 2 or more days. 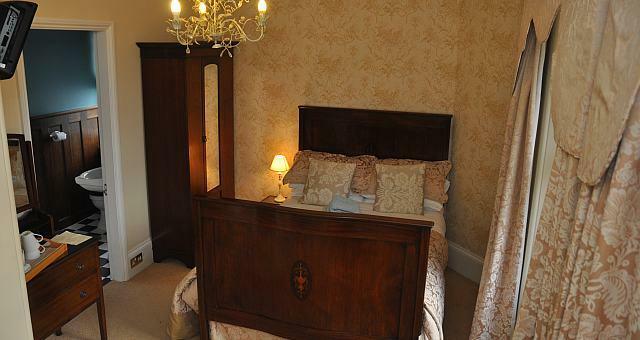 Double room with original antique furniture, has 2 windows looking out onto large garden and the en suite has a lot of natural light with a double sized shower. The bed isn’t a 4-poster but fantastic mahogany serpentine footboard with marquetry work but with a top quaity mattress. room 4 sometimes limits bookings to 2 or more days. An excellent B&B - friendly, helpful hosts; terrific breakfast; comfy room and bed; very convenient gateway to the Lakes. 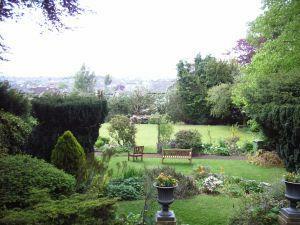 A beautiful period house with a large terraced garden giving fabulous views to the Lakeland fells. Stunning dining room with amazing views, and a beautiful sitting room for guests and outside bike storage and plenty of parking. A special place to stay with a warm and friendly atmosphere and a special emphasis on local quality food with home- made bread, freshly ground coffee. On arrival there is usually home made cake and freshly brewed coffee with tea on request. we are always happy to discuss special dietary requirements. Storage of bicycles and tools for repair. Private dining/lounge room. Wi-fi access. Children welcome from any age. From M6 jct 40 take the 1st exit for Penrith. Go straight across mini-roundabout and pass Focus DIY store on left then station on left. Bear left at next mini- roundabout up hill for 100yds to next mini-roundabout. Go straight across, look for WCF store on left and Morrisons on right. Straight on down hill into town. At bottom of hill bear left, keep in right-hand side lane double back towards town and take 1st left into Portland Place. At mini-roundabout turn left and take 2nd right into Graham Street. Bank House is three quarters of the way up on the right-hand side just before the bend.